Join Thomas and Fabrizio as they experience the joys of cooking. The sandwich is created by Nick Cormack and is comprised of Turkey, Strawberry Jam and cereal. Despite it’s description as a “self-inflicted punishment to atone for past sins,” Thomas greedily gobbled down this mighty chow. With a heave and a ho, and a belly full of yum and fun, Thomas giggled and played, until he grew tired, at which point he laid on the ground and took a big ol’ cat nap. Surprisingly, he found the sandwich delicious , which convinced Fabrizio to order it as his lunch the very next day. Peter seeks guidance from Dr. (not a real doctor) Dixon. Mario’s voice guides Ahmad’s body step by step through the process of taking a caller live on air. Hey there everyone! My name is Audrey, and welcome to my new blog series, Music Videos You Should See! There are so many amazing music videos out there that a lot of people have never seen. I have many of my own favorites, and I thought I would share them with you all here. I figured I would start this series off with my favorite one of all time. Not only is the song itself incredible (I swoon every time it comes on the radio), but the music video is genius. Here, how about I put the video down below. You can watch it, then read the rest of this article. Alright, now, I’m hoping by now that you’ve watch the video. If you haven’t, be warned, SPOILERS AHEAD!!! Okay, we good now? Awesome. So, pretty amazing, right? I know. The video was directed by Ellis Bahl who has directed many music videos and some short films and sketches. The narrative that he has managed to create with this video alongside the song still manages to hook me, even though I’ve seen it about a billion times. So what is the director, along with the band, attempting to say in this video? When the story starts (or ends, whichever way you want to look at it) we seem to be watching a young woman getting chased down and killed by her husband. As the story unfolds, we see more and more of the fighting between them, but the woman is fighting just as much as the man is. They fight over the breezeblocks (or cinder block as it is known in the U.S.), but he ultimately picked it up. Then we see that she threw a glass at his head and attempted to trip him up by grabbing his leg as he tried to get away. We watch as they fight with one another, getting thrown all around this small apartment. The mystery is still there though, who are we, as the audience, meant to be rooting for? Suddenly another woman comes int the frames, obviously very emotionally upset. If it was tough for you to understand this part, I’ll break it down for you. The man comes home and finds who seems to be his wife in the closet with tape covering her mouth. Then the woman who we see throughout the rest of the video comes out from hiding with a knife and attempts to stab the man, setting off the chain of events that leads us back to the beginning. It also helps sometimes to watch the reverse of the original, to see everything happen in chronological order. So why tell the story like this? 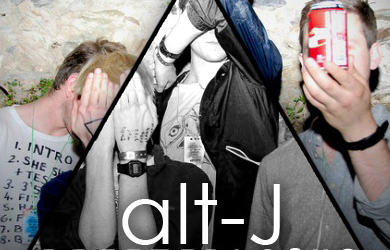 Well, I believe that Bahl along with alt-J was trying to bring a message to their audiences. Don’t always assume you know who the ‘bad guy’ is until you know the whole story. We start by seeing a man seemingly abusing and murdering his wife. But as the story unfolds we see that this woman had his wife trapped and was going to murder the man. As the audiences, we don’t have anymore information about what led up to this. Who is this woman? They both seem to know her. Perhaps she is an ex-girlfriend of the man’s. We just don’t know. But the point is that we need to be shown the entire story before we can make our own conclusions. Was he defending himself, or should he have called the cops? It all happens to quickly. Anyhow, I hope you all enjoyed this week’s video as much as I do! Make sure to check in next week as we take a gander at Mountain At My Gates by FOALS.